We review the LG Optimus 2X, but does LG’s super-powered smartphone live up to its lofty marketing claims? We investigate.LG likes to keep up-to-date with current trends. Whether it’s glasses-free 3D devices or dual core toting smartphones, the Korean tech-giant has got it covered. We’ve yet to get our hands on LG’s glasses-free 3D tablet but we’ve had the pleasure of it LG Optimus 2X – LG’s debut dual core Tegra 2 smartphone – for just over a week now. It’s got a dual core processor, HDMI-out port and an 8-megapixel camera, which certainly sounds premium – and it should. The LG Optimus 2X is LG’s flagship Android handset. This means that it’ll be going head-to-head with the likes of the HTC Sensation, Samsung Galaxy S2 and the Motorola Atrix. But does LG’s latest effort stack-up? We investigate.Looks The Optimus 2X measures in at 123.9x63.2x10.9mm and weighs 139g – that’s 4G heavier than the Atrix. The WVGA 4-inch display clocks up the standard 480x800 pixels and is decent enough – although we would have preferred a Super AMOLED Plus or qHD if we’re honest. There are three hardware keys: two for volume, located on the upper right hand side and a power/unlock button on the top right. On the left is your 3.5mm jack and in the middle is the HDMI-out. The front of the Optimus 2X is fashioned from Gorilla Glass with a faux metallic edging that runs around the entire device. The back, in true LG-style, is plastic all the way apart from a brushed metal strip beneath the camera that has ‘with Google’ stamped on it – not very classy. It’s also way too long. The virtual keys for Home, Search, Settings and Menu sit below the screen with about half a centimetre of room above and below them. Combine this with the virtual keys themselves and you’ve got about an inch of pretty much unused space at the bottom of the device. LG could have made the device significantly smaller, or extended the display some more. Either way would have worked. Instead, there’s just a platform at the bottom of the device with a four virtual keys floating around in the middle. All in all, we weren’t sold on the looks of the Optimus 2X. It’s very plasticky and doesn’t look as premium as it should. It’s essentially very middle-of-the-road-looking and while this isn’t necessarily a bad thing, it’s really not good enough for a flagship device. Especially when you’re competing with the Atrix, iPhone 4 and Samsung Galaxy S2. 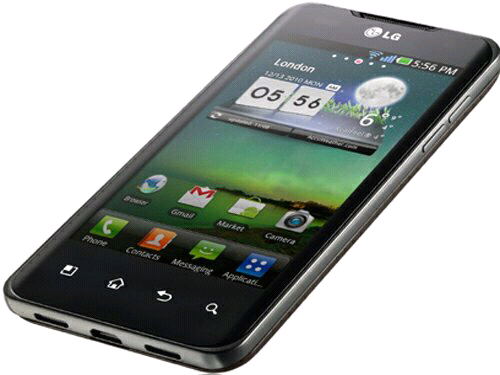 Internals LG’s Optimus 2X is the first Tegra 2 1GHz dual core-powered smartphone to hit the UK. It also squeezes in a low-power NVIDIA GPU too, along with 512MB of RAM, 8GB of internal storage and support for an additional 32GB via its microSD slot. Wi-Fi 802.11 b/g/n, DLNA and Wi-Fi hotspot creation are all also present, as you’d expect. As is HSDPA, 10.2 Mbps and HSUPA, 5.76 Mbps – so far so good, then. But how does this translate into performance?